Got Ants? Call Yankee Pest Control at to have a member of our professional pest management service team conduct an inspection and treatment of your property. We will evaluate the situation and make sound recommendations as to what should be done to eliminate the ants and correct the conducive conditions. They hide in chimneys, attics, garages, anywhere that people don’t use on an everyday bases. The most common structure-infesting ants in the northeastern United States are carpenter ants, pavement ants, pharaoh ants and little black ants. Knowing the species of the ant involved provides clues where to look for the ant’s colonies and which treatment procedure to use. The biology and habits of each species is unique. Ants are remarkable creatures and one of the most successful animals on earth. 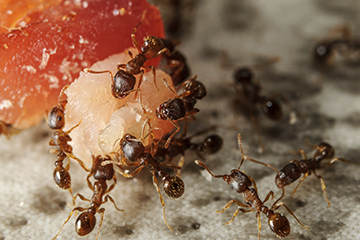 In nature, ants are a prime food source for many animals. They aerate more soil than earthworms. They have taken advantage of every conceivable environmental niche and can be found in almost every region. Ants are successful because they are social insects often forming complex colonies. Ants are very adaptable and exploit numerous different living environments and food sources. The presence of ants in nature ensures the health of the natural environment. In homes and other buildings, however, ants are not so welcome. The same reasons ants are successful in nature makes them well suited to sharing man’s living quarters. 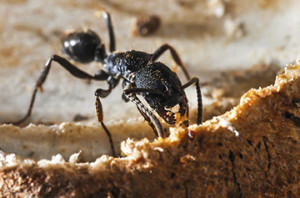 Structures can be threatened by damage from carpenter ants. Pharaoh ants can carry disease. Identify the ant or ants involved. Formulate a corrective action plan. Today’s technology allows your pest management professional from Yankee Pest Control several different methods of controlling your ant problem. Our service professionals have a full working knowledge of building construction practices, ant biology and current control practices. Only after conducting an inspection and identifying the type of ant involved, their feeding habits, conductive conditions and colony locations will our service professionals make treatment recommendations. We may suggest any one of or any combination of these control procedures: baiting, direct colony treatment, structural modifications, perimeter treatment, dust or aerosol treatments to construction voids, applications to the base of trees, removal of vegetation and spot treatments. The application of pesticides in and around your home or building without first fully understanding the problems and other service procedures available may result in unnecessary use of pesticides and in some cases cause the ant problem to worsen. An example of making an ant problem worse by not being fully aware of ant biology and currently available procedures may result if one were to spray a liquid pesticide inside a structure to solve a pharaoh ant problem. In such cases the pharaoh ant will commonly “bud out”. What this means is the ant colony has recognized a problem and restructured itself to avoid the pesticide and create several new nest sites. Lets pay a little extra attention to carpenter ants. These ants can do significant damage to wood; this could be trees, buildings or other wood timbers. Most often they will be in moist or damp wood. Signs of carpenter ants include: seeing the ants themselves, damaged wood, wood frass in areas of the infestation and ants carrying hammers and saws (pest control humor). The frass is simply wood chips that the ants have excavated from the timber they are nesting in. Ant body parts are usually mixed in with the frass. In most cases the damage in the wood will “go with the grain”. The wood will seem as if the ants sanded it smooth. As with most wood destroying insects you must first look for water or moisture damage to the structure. Always remember carpenter ants need damp and moist wood. When it comes to wood destroying insects in the northeastern United States the three most important things to remember are, Moisture, Moisture and Moisture. If you can control those three things you can usually prevent wood destroying insects, especially carpenter ants from establishing a new nest. to have a member of our professional pest management service team conduct an inspection and treatment of your property.